Stand straight with your feet shoulder width apart and hands by your sides. This is the start position. In one smooth motion, squat down and place your hands palms down on the floor in front of your feet. Jump your feet out by spreading your legs, so that they are wider than hip width apart, then immediately jump them back together. 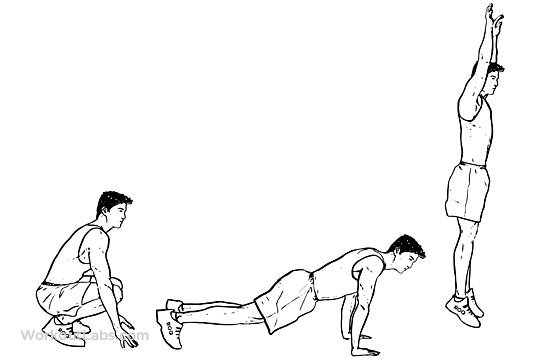 Complete 1 full push up. Jump your feet forward to just behind your hands. Use an explosive motion to push through your heels and return to the start position.